My mani today was inspired from a video on Instagram by @nail.art.by.sarah and I absolutely love this design. To create this I used; OPI – nail envy, L’oreal – Raven, Zoya pixie dust – Bar, Nanacoco – love black, and Seche Vite – fast drying top coat. 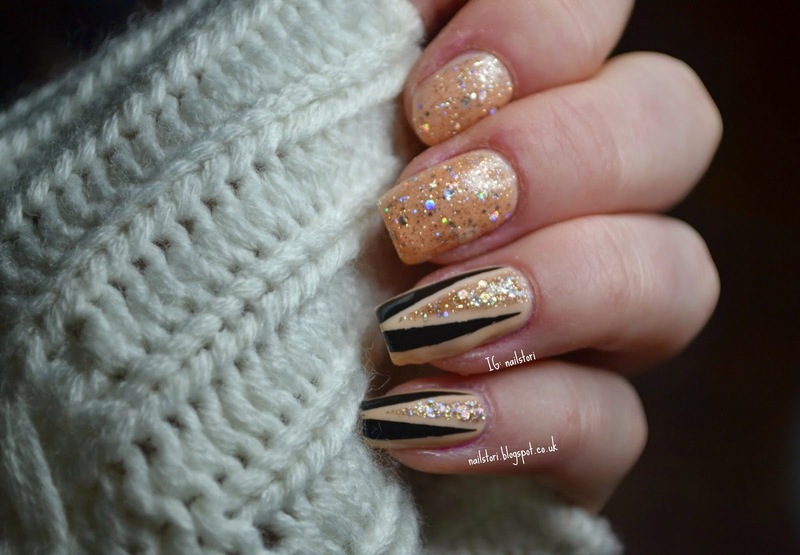 I created this using striping tape and it was surprisingly easy to do. Just got to have a small brush and patience! On to the new polishes… love them all! Zoya Pixie Dust is incredible. I’ve wanted it for so long and it did not disappoint. It is the easiest glitter polish to apply, dries so quickly as a sort of textured polish so gives such good coverage without needing to use a sponge. Next is the Nanacoco black nail polish, I got this just because I needed a new black and could never find a great one that didn’t stain really bad but I found one (and it was super cheap). Yay. Finally, saving the best for last… Seche Vite. I have heard nothing but good reviews about this top coat. Oh my goodness it is the best nail polish I’ve ever used. It lives up to its fast drying name, I mean, it is fast. This mani hadn’t completely dried but I just went with it and applied a little early and it was amazing, completely set within 5 minutes. Also, the shine makes any polish look like gel. Get yourself the Seche Vite top coat – it will change your nail life. You’re welcome.